The American housing market is still in the doldrums according to the latest S&P/Case-Shiller Home Price Index which showed that U.S. home prices are down a record 5.9% from the corresponding quarter last year (2010). But there is some good news in that home prices are up 3.6% from last quarter. The latest report also highlights the growing disparity in the national housing market with some states well on the way to a housing recovery (like NY, CA and Washington DC), while others are still still seeing falls (MI, AZ and FL). Nationally, home prices are back to their early 2003 levels. Thinking of refinancing? Click here to get the best rates in your area. In November, only four Metro areas tracked by the index – Los Angeles, San Diego, San Francisco and Washington DC – showed year-over-year gains. 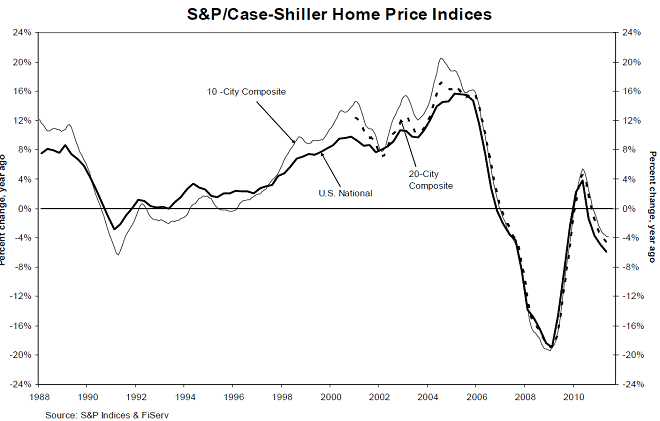 The Composite indices remain above their spring 2009 lows; however, nine markets – Atlanta, Charlotte, Chicago, Detroit, Las Vegas, Miami, Portland (OR), Seattle and Tampa – hit their lowest levels since home prices peaked in 2006 and 2007, meaning that average home prices in those markets have fallen even further than the lows set in the spring of 2009. With these numbers more analysts will be calling for a double-dip in home prices….which could be confirmed before Spring. [Updated November 2010] The future of the housing market is one of the most disconcerting unknowns for Americans. Homeowners are naturally worried about the price and future of what is normally their largest asset. Would-be buyers and sellers are finding it hard to close on deals because of the uncertainty of future prices and difficulties in getting a loan. Renters get impacted by higher rents, as more people rent rather than buy. Thus people in all walks of society are directly impacted by the future of the housing market. Not a day goes by where there isn’t another article or political debate talking about the housing crisis and along with the unemployment outlook, is the biggest economic issue facing the nation where one’s home and job drive provide the basis of their financial security. – Home Sales and Inventory: Housing sales have plunged further following expiry of the home buyer credit and in July were at their lowest level in more than a decade, well below the lowest analyst forecasts. According to the National Association of Realtors (NAR) the annual home sales rate of 3.83 million was 25.5% below the level of a year ago and down 27.2% from the previous month. Analyst’s only expected a 13% decline, in what is normally the strongest home sales period. The extra supply and unsold homes lead to lower prices as sellers get desperate to sell and face possible foreclosure in the longer term. The number of homes for sale increased only slightly in July but the large drop in sales was enough to push inventory levels to 12.5 months, which is twice normal levels. Higher inventories tend to cause home prices to decline as supply outstrips demand. – Number of Foreclosures and Rate of Increase/decrease. Foreclosures are a strong indication of the housing market health. In the latest reports, foreclosure are up 3.6% from the month before but down 9.7% from 12 months earlier. This mixed messages suggest that while things are still bleak for the housing market, they aren’t as bad as last year. There were more than 320,000 foreclosure filings – including notices of default, auctions notices and bank repossessions. That is the 17th month in a row total foreclosure filings exceeded 300,000. Lender repossessions were similar to last month around 94,000. Repossession is the final stage in the foreclosure process; however people can stay in their homes until the point that the bank takes possession of the home or sells it at auction. – Home Prices. If people feel their home value is steady or going up, they are more likely to spend which spurs economic activity/growth. 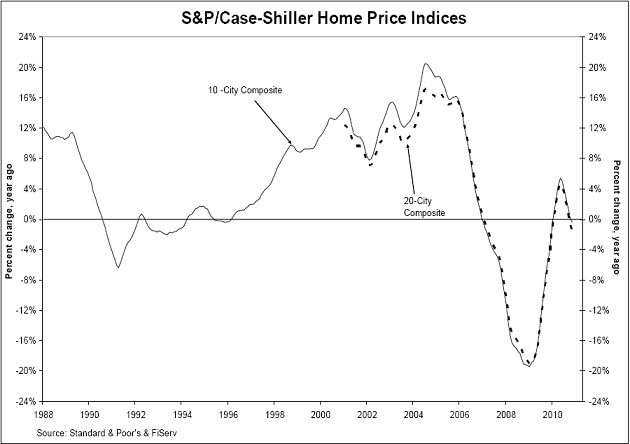 The trend in home prices is normally measured via the nationally recognized S&P/Case-Shiller index (CSI). The CSI is a 3-month moving average (so August home prices, reflect the average of June, July and August), based on repeat sales of the same properties. It covers 20 metro (city) areas across the nation. The other national home prices index is the Federal Housing Finance Agency (FHFA) index which is calculated using purchase prices of houses with mortgages that have been sold to or guaranteed by GSE’s Fannie Mae or Freddie Mac. The latest Case-Shiller home price index shows national home prices falling by 0.2% in August. This was the first drop in the CS index after four straight monthly gains (driven by higher demand from the home buyer credit that expired in April. On an annualized basis, home price appreciation slowed to 1.7% from 3.2% last moth, with prices falling in 15 of the 20 metro areas tracked by the CSI index. The median forecast of 27 economists surveyed by Bloomberg projected a 2.1 percent increase. The measure is 28 percent below its peak in July 2006. Chicago, Detroit, Las Vegas, New York and Washington, D.C. were the only five cities that recorded small improvements in home prices over July. 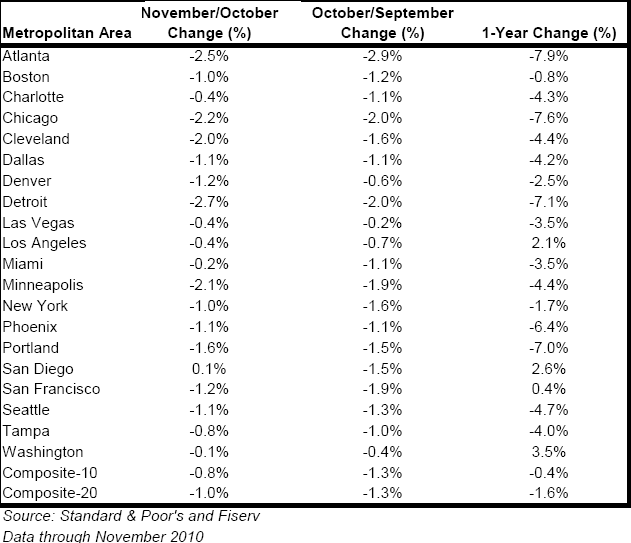 On a year-over-year basis, 12 of the 20 metropolitan areas posted negative growth rates. The FHFA home prices index report, showed contradictory results in which U.S. house prices rose 0.4% on a seasonally adjusted basis from July to August. The positive tone of the report however was muted because declines in July and June were deeper than previously estimated. The continued fall or slowdown in the home prices was worse than expected and confirmed views that the lack of follow through from the expired home buyer tax credit combined high unemployment, record foreclosures and shaky economic environment is going to place additional downward pressure on home prices as demand slows in cooler months. – New Home Starts : Last week, the Commerce Department reported that May construction starts on single-family homes fell 17% to an annual rate of 468,000, the lowest level in a year. This has prompted builders to slow construction – which should assist inventory levels but also cause an increase in construction sector unemployment. – Rentals : The record rates of foreclosure are driving a surge in rentals as home ownership eludes many. Further, baby boomer kids are leaving the nest and flocking to apartment complexes’ driving up rents. The number of occupied apartments increased by 215,000 in the 64 largest U.S. markets in the first half, according to MPF Research. That’s almost double the units added in all of 2009. The U.S. home ownership rate fell to 66.9 percent in the second quarter, the lowest since 1999, according to the U.S. Census Bureau. The rate peaked at 69.2 percent in the fourth quarter of 2004. A sign of rising housing demand (and prices) will be reflected by a slow down in rental demand. It is unlikely that the national home price average will rise much for the remainder of 2010. Some metro’s like New York, Washington DC and San Fransisco may experience moderate growth thanks to stronger job markets, but hard hit regions in Nevada, Florida and California are likely to see significant variability in home prices. Until the rate of foreclosures and unemployment show a meaningful drop, it is going to be very hard to see sustained home price increase. Analysts on average expect home prices, as measured by the S&P/Case-Shiller national index, to decline between 1 and 2 percent this year, then rise by a similar amount in 2011 and up to 3% in 2012. For the five years ending Dec. 31, 2014, they see a rise of 10%. Even with these rises, average home prices will still be well below their peak prices in 2006. 2011 will be a critical year for housing, driven by the level of unemployment, a new political balance following the mid-term elections (in which the Republicans are expected to take control of the house) and greater clarity on the role of the GSE’s – Fannie Mae and Freddie Mac (the Obama administration is to put forward a plan in January 2011). This could all see a moderate increase in home prices, or at least some stability of prices in hard hit markets. Well said Garth. I believe you have hit this one dead on…. Unfortunately, 2011 will not be the year the housing market recovers. Instead it will remain in a state of depression. New home starts will not exceed 425,000, the peak being 1.6 million in 2006. Inventory will hit an all-time high. Home prices will continue to fall nationally. Foreclosures will slow in the beginning of the year, but pick up speed in the second half, delaying the housing recovery until late 2013 or early 2014 at the earliest. Here’s what GSE economists at Freddie had to say. Pretty relevant to this article. Low Mortgage Rates. By November, fixed-rate mortgage rates had drifted down to their lowest level since the early 1950s. This laid the foundation for a substantial refinance boom, with refinance accounting for four out of every five single-family loan applications. With Fed observers expecting the central bank to keep the federal funds rate at its current target range of 0 percent to 0.25 percent for most (or all) of 2011, relatively low mortgage rates will be a feature of the 2011 mortgage market. While some rise in fixed-rates is expected, 30-year fixed-rate loans are likely to remain below 5 percent throughout the year, and initial rates on 5/1 hybrid ARMs will likely remain below 4 percent in 2011. House-Price Recovery. Softness in house prices generally occurs in the autumn and winter months related to the seasonal slowdown in home purchases, and this season is little different from past ones in that respect. Those local markets that have relatively large inventories of for-sale homes and real estate owned (REO) dispositions will continue to see home-value weakness in 2011. However, price indexes for the U.S. as a whole are likely close to bottoming out. Most experts look for single-family U.S. indexes to bottom out in the first half of 2011, with a gradual (but sustained) recovery after that: The Wall Street Journal’s Economic Survey for November found that economists expected the Federal Housing Finance Agency’s U.S. Purchase-Only House Price Index to rise by an average of about 1 percent over 2011. Homebuyer Affordability. The three main ingredients that affect buyer affordability are mortgage rates, house prices, and income. With the first two at or near cyclic lows, buyer affordability is at the highest level in decades. The National Association of Realtors’ Affordability Index for the third quarter reported one of the most affordable buying markets since the inception of the index in 1971. With affordability high, many first-time buyers will be attracted to the housing market in the new year, likely translating into more home sales in 2011 than in 2010. Fewer Mortgage Originations. More sales in 2011 generally mean more purchase-money originations, and that should be a feature of next year’s market. However, refinance activity will likely dwindle over the year as a result of at least three factors: (1) many borrowers have refinanced over the past year or are currently in the midst of refinancing, and hence will have little need to do so again in 2011; (2) Making Home Affordable’s Home Affordable Refinance Program is scheduled to expire on June 30, further dampening second-half refinance volume; and (3) while fixed-rates are likely to remain below 5 percent, these rates are also expected to move gradually up during 2011, reducing the financial incentive to refinance for those borrowers who have not done so already. The expected decline in refinance originations more than offsets the potential pickup in purchase-money originations, leading to lower total lending in 2011. Lower Delinquency Rates. Single-family mortgage delinquency rates remain extraordinarily high but have begun to decline in the aggregate. Based on the last several business cycles, the share of loans 90-or-more days delinquent or in foreclosure proceedings, known as the “seriously delinquent rate,” generally crests within a year of the start of the recovery in payroll employment, and this economic recovery appears to fit within that pattern. Payrolls began to rise last January and by the spring the seriously delinquent rate had begun to decline. Look for the seriously delinquent rate in the overall market to gradually decline further during 2011, reflecting employment gains and family income growth, additional loan modifications and other foreclosure alternatives, and the transition of foreclosed homes to REO. I don’t get why everyone bunches up America as one housing market. Every region is different. Here in NY, there are still multiple bids for properties and my wife and I have missed out on 3 homes we put offers in for above the asking price. Also, good luck getting a decent place for less than 500,000 here. Perhaps rather than a home buyer credit, people should get an incentive for moving to Florida, Iowa or Arizona to boost home prices. I’m beginning to see a pattern here, I think. Recession coming, taxes must be cut. Good times arrive, don’t raise taxes it will cause the good times to end. Next recession comes taxes cut again. Good times return, mustn’t raise taxes and end the good times. The logical conclusion I must draw is that with enough business cycles taxes must eventually go to zero. As to government making better use than we can of our money, it depends. I’d rather have the government financing the space program which led to cell phones than individuals spending the money dining out. No corporation is wealthy enough to spend the time and money to create the Inernet. Shareholders would complain during the 20 to 30 years necessary. As to mandated redistribution of wealth, all government actions and inactions affect some redistribution of weath. I just don’t see how taxing people who have little or no money is going work out. Only people with money can pay taxes if you think about it. It’s not a drive to punish anyone, you rob banks because that is where the money is. It just seems to me, that the poor and those on welfare, even if they are 10% of the population don’t have the political power to influence those who set up the welfare programs and assistance. Look hard enough and somebody with money gains when welfare is increased and those are the people with influence. “No Money Down, No Income Verification, No Citizenship Status loans” that you shoved down the throats of the Lenders, with threats of Lawsuits from the Government if these loans were not made (especially if the applicant happened to be Illegal or a Minority) Then along came Hussain “The Blame Game” Obama, who gave away Billions to Banksters that didn’t help out ANY Homeowners that were Legal American Citizens, followed the rules, actually put money down, and verified their Incomes. The only bailouts were for those that should never have been approved in the first place. They scored twice! Great job, Mr. President! The problem I see is new homes will end up becoming much cheaper than existing homes leaving the banks holding tons of foreclosures. The banks will have to flood the market eventually as they are taking major losses by holding this inventory. Walking away from second (or a investment home) is all but assured as return on investment will not be realized. The housing market will remain unstable for some time with pressure to the downside.